Men how many of you shave at the sink? Well if you do I want you to try something different…shave in the shower! Make sure that you massage shaving creams or gels into the skin and shave in the direction of your hair growth (to prevent ingrown hairs). 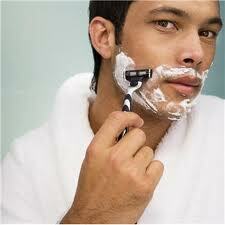 Make sure you wash your face after shaving and pat dry (don’t rub) then apply a moisturizer.